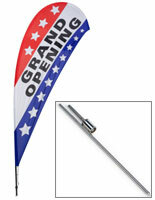 These banner flags with red, white and blue message are perfect for upcoming grand openings. 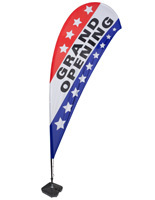 The polyester flag is sold with the pole and cross base. 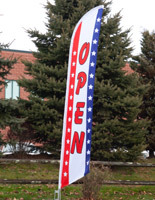 Each bold banner flag stands at 135" tall for maximum viewability. The included water base provides extra stability in outdoor settings. Keep in mind that the flags are not made to withstand winds exceeding 20 mph.